Thermal Flashlight Plus – In progress! The thermal flashlight is fascinating; however, after building up the original version from the Public Laboratory, it seemed like we could really start to add some neat features to it. The original thermal flashlight was simple, but other folks have done some neat modifications; one that struck me as an excellent upgrade was the one that used an LED flashlight to increase the intensity of the beam, and to make it a bit more usable in the field. It’s always good that there be some way to capture quantitative data and display it. So, using some of the same code and parts from the ‘thermistorcator’, a hybrid was made, using the Dorcy flashlight from above, and an Adafruit OLED, for a better display. Also added were a few input buttons, so that the lower limit and upper limit of the temperature range could be set on the fly. At some point, using some neat manipulation of the input buttons, it should be possible to set the values of lower and upper limits to specific values. The prototype is shown below. It is a bit ugly, but it was the quickest way to walk around with the entire apparatus and try it out. 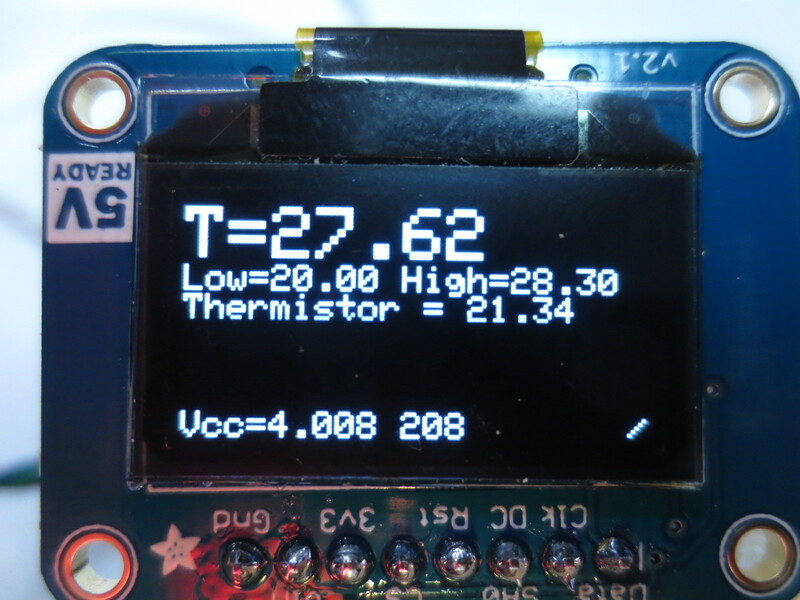 A closeup of the screen is shown here (the numbers at the bottom show the voltage and the amount of free memory in the program). There will be two simple PCB boards to make up for a more polished result; one for the flashlight head (replacing the flashlight LEDs), and an internal one to mount the Arduino Nano and a provision for an external thermistor that will allow the user to verify the temperatures being displayed/recorded. 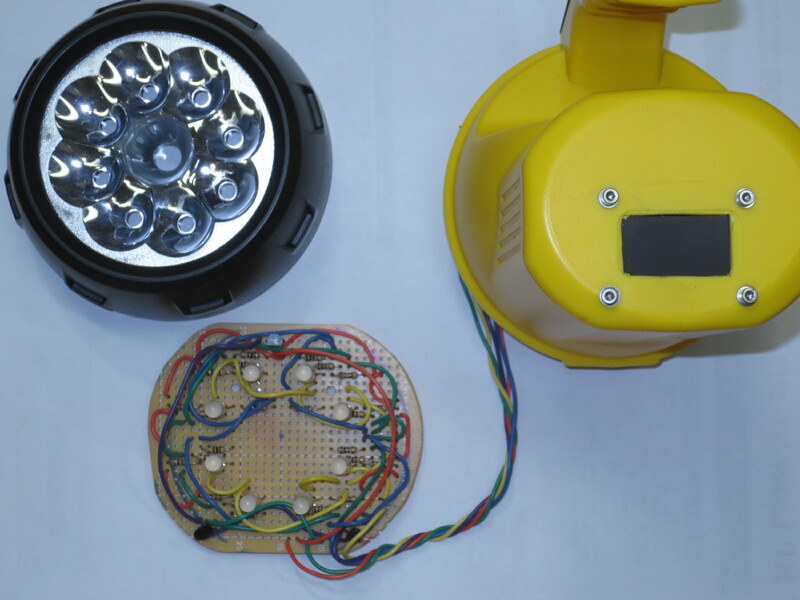 A thermistor in the head of the flashlight has also been provided, so that the temperature of the circuit can be monitored to compare it with the ambient temperature recorded by the sensor itself. The Arduino USB port will output the data, of course, so that it can be logged by a nearby computer. A tilt sensor will be added, so if the flashlight is turned upside down, the display will still be easily readable. The work in progress is shown here; buttons will have to be added to the rear of the case, as well as a hole for the Arduino mini-USB, and a connector for the external thermistor. The boards for the flashlight have been sent out (OshPark), and should be coming back soon. The board for the internals is being designed now. 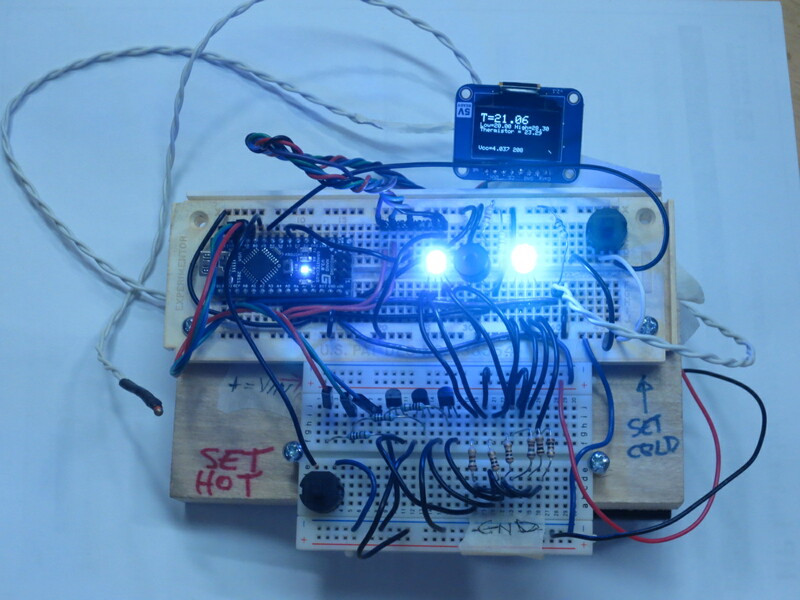 This entry was posted in articles and tagged projects, thermal flashlight. Bookmark the permalink.